The Polamatic Made in Polaroid iPhone and iPod Touch app brings back the cool vibe and spontaneity of Polaroid photography. There is no longer a clunky, awkward camera to carry, but instead, your Polamatic iOS app converts your camera and existing photography with ease and fun. The Polamatic iOS in-app camera is free of intricate settings and details, just like the original camera. The fun of the Polamatic iPhone and iPod Touch photography app is the selection of the framing and effects, as well as the addition of text and sharing capabilities. The Polamatic iOS app has clean, intuitive navigation for adding effects. Your photo fills the middle of the screen, and a standard navigation bar at the bottom of the screen. You navigate between the tools, sharing, and settings from the bottom menu bar constantly available in the process. For the effects and frames, a horizontal bar with thumbnails appears at the top of the screen. Using responsive gesture controls, you slide your finger back and forth to select. The processing time for the Polamatic iOS app is quick and precise. In addition to adding frames, you can add photo effects similar to Instagram and Hipstamatic. There are 13 effects in the Polamatic iPhone and iPod Touch photography app reflecting different photo development styles and themes. You may also add text to the bottom of your Polamatic iPhone and iPod Touch photograph. When you touch the pencil icon at the bottom of the screen, the keyboard appears and a row of colors. You type your text, and you can adjust the colors with a simple touch on the preferred color. 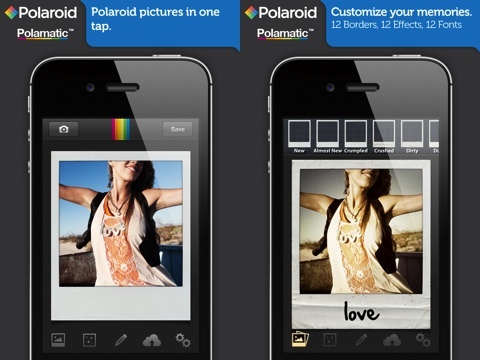 The Polamatic iOS photography app incorporates one touch sharing with Facebook, Twitter, Flickr, Tumblr, and Instagram. You may also save the photo to your iPhone and iPod Touch libraries. The Polamatic Made in Polaroid iPhone and iPod Touch app is a reasonably priced $.99. There are currently three in-app purchases. You may purchase additional frames and effects for $.99 each. A neat in-app purchase is the ability to purchase boldly-colored frames for $.99. This selection brings a modern perspective to this great throwback iOS app. AppSafari review of Polamatic | Made in Polaroid was written by Jenni Ward on July 2nd, 2012 and categorized under App Store, Photos, Social, Video. Page viewed 4331 times, 2 so far today. Need help on using these apps? Please read the Help Page.